These Vehicle wraps will look great on wrapped any car truck or van. Our car wraps are printed for a cheap rate using quality 3MIJ180c vinyl for durability and 3M brand quality. And includes 8519 Laminate for extra protection. We are offering at our lowest price possible so you can save on your car wrap printing or any vehicle wraps for that matter. So if you are looking for a great way to advertise your business a vehicle wrap may be right for you. Our vehicle wraps also come with free shipping via FedEx Ground to commercial addresses. Residential delivery is an option available. • How can we offer our vehicle car wraps at such a cheap rate? We always try to offer the lowest price possible online. So we often run on a low profit margin. Yes you can resell these car wraps for a higher price. • What color is the vinyl? We can print any shade of CMYK color making your wrap pop with color. The vinyl is originally white with a specific adhesiveness manufactured to apply on a vehicle. White is a great color as once we print your vehicles underlying colors are no longer visible creating a great looking vehicle wrap. • What happens if I want to remove this later? We recommend applying heat to help you peel it off your car truck or van. This adhesive can be removed to have your vehicles original paint unharmed. Bu we do recommend studying up on youtube on how to remove the vinyl. There are also many professional car wrap installers in local areas who may offer this service. • Do I need to do a full vehicle car wrap or can I just do a piece? 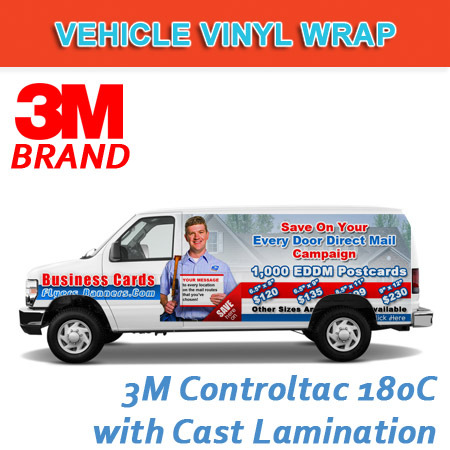 This vehicle vinyl wrap is great for a whole entire car wrap or just a door.